Shipping: **Free Shipping** This product now has FREE SHIPPING. The price you see may seem higher, but it is the same as last year with shipping built in. This product now has FREE SHIPPING. The price you see may seem higher, but it is the same as last year, with shipping built in. 378 National League player labels for Fantasy Baseball, with no draft board. Position included are 1B, 2B, SS, 3B, C, OF, SP, RP, & DH and blanks for each position. 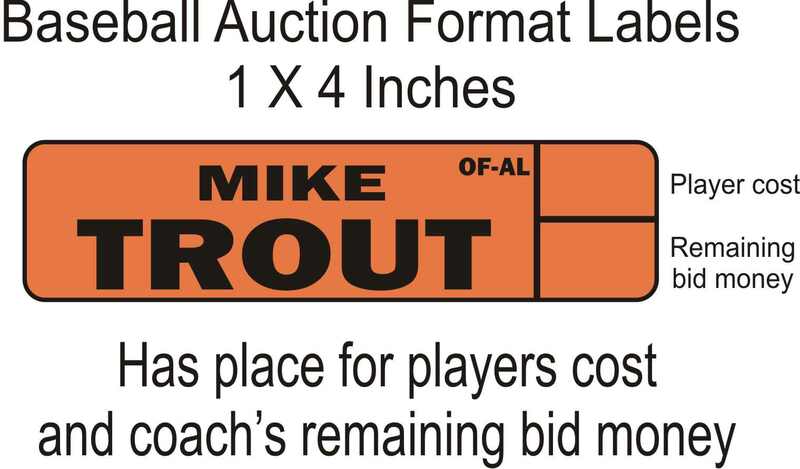 All baseball labels are 1 X 4 inches and auction format. This is for leagues that make their own Draft Board and only what the updated player labels.